Let's start with understanding what exactly a VPC is. Think of it as an isolated networking wrapper around all/part of a customer's infrastructure in the cloud. Each customer needs their own isolated piece of the cloud and VPC facilitates this need by providing managed networking functionality for your cloud resources. The term VPC can mean different things based on the cloud provider being used. Traditional VPC being discussed here is just an example of what is traditionally meant by a VPC in most of the public cloud providers. In the diagram shown below, each of the grey boxes is a different VPC and each of them is located in a separate zone (US West & US East). Now, if the compute resources in these two VPCs have to communicate with each other, they will have to route through the VPN gateways via internet. Hence, your VPC is regional in the sense that resources cannot communicate with each other without going through the internet. Imagine adding an additional region to your stack. You've guessed it right! you have to go through the setup all through again and it is not easy to seamlessly expand in this setup. Google VPC is Global by default. What that means is, for the same scenario described above, we could put two subnets one each for the two different regions and still put both those subnets in the same VPC. Now that is what a truly global VPC looks like. It doesn't matter, which region your subnets reside in, you could still wrap all those required subnets into one global VPC. Therefor, technically, the compute resources shown below are communicating in the RFC 1918 space without having to route through the Internet. Now, this raises an interesting question! how is it that the Google VPC is global by default and traditional VPCs provided by almost all other public cloud providers are regional? Google over the last decade has invested a lot of time and money in building their own network all over the globe for their pre existing products like the google search engine, youtube, gmail etc. 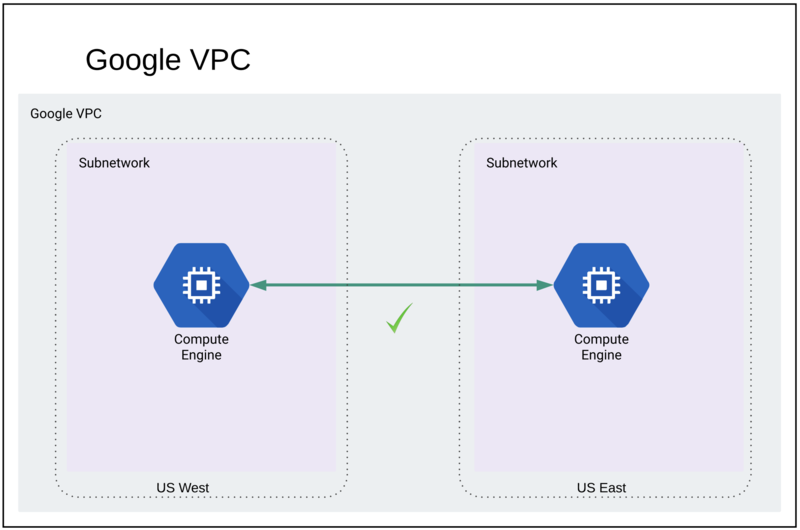 GCP being their new venture into public cloud offering is now by default the beneficiary of all those years of research which makes things like Global VPC look very simple. 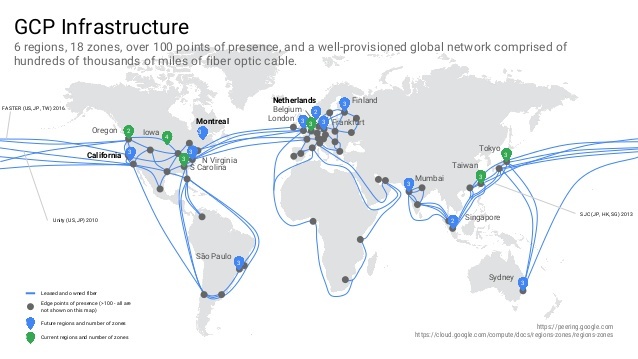 The above is a snapshot of existing GCP infrastructure across the globe. The above is just one advantage of using GCP. 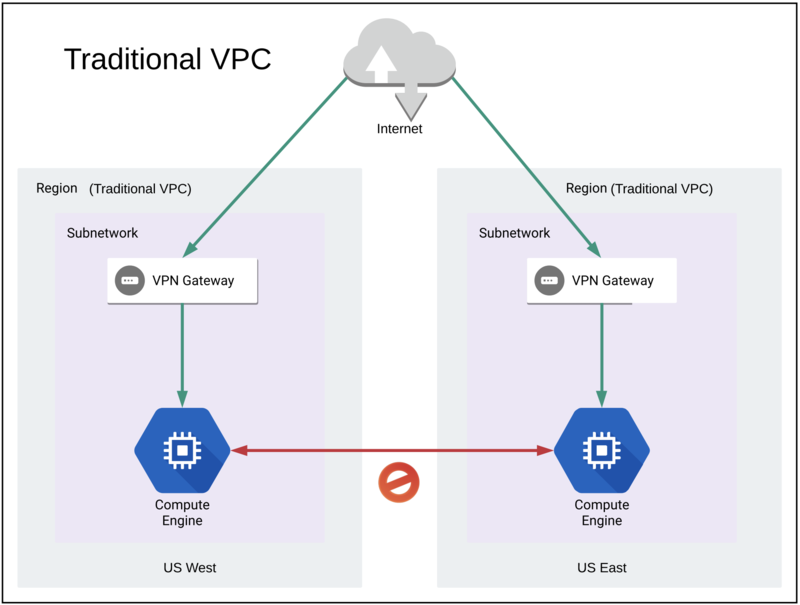 more on Google VPC here.